Growth You Have To See To Believe! 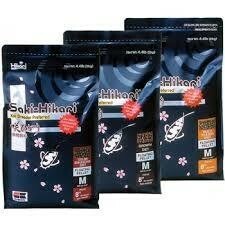 Saki-Hikari® Growth was specifically developed for raising jumbo koi. Our intent was to provide a nutritional package that would help koi breeders raise koi that were bigger than previously possible without negatively impacting water quality or the overall health of their koi. Saki-Hikari® has the proper levels of necessary vitamins, minerals and digestive enzymes. It also contains a uniquely balanced combination of proteins, fats and carbohydrates. Finally, the inclusion of beneficial living microorganisms offers many benefits other foods cannot. For the championship body your koi deserve and you crave, feed Saki-Hikari® Growth!